The Tamagotchi P2 was released shorty after the P1 in 1997. It is very similar to the previous versions in terms of programming, however it has new characters, games and a different background. The character that you obtain on this Tamagotchi depends on what type of care you give it. For a list of all the characters and a growth chart, check the links on the side. The Original Tamagotchi was released in November 1996 in Japan and 1997 for America and Europe. 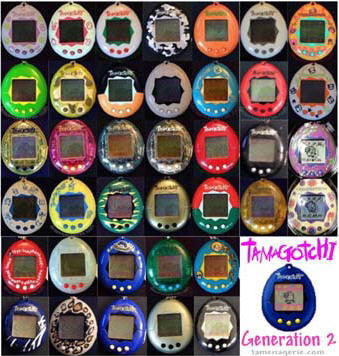 Shortly after (1997) a second generation was added to the Tamagotchi Family, this was known as the P2. The two generations were very similar in terms of programming, but the P2 had a new game, New food and snacks as well as a new set of characters. Several New colors and designs were made. This is how you can distinguish the P2 from the Original P1. In Japan there were two different versions in Japan. The different versions were the same apart from that 1 of the characters was replaced with a new character Nyatchi. The icons are all the same as the ones that were released on the the original Tamagotchi. To navigate around the tamagotchi you must press the A button (the first button) and this will highlight the first of the 7 icons at the top and bottom if the screen. The first icon is used for feeding your tamagotchi character. The options available are Meal and snack. Meal is used to feed your tamagotchi a meal which raises your hunger hearts. Each mean raises your tamagotchi's weight by 1lb. Snack is used for a snack and for making your tamagotchi happy. This fills up the hearts but adds 2lb onto your weight every time it is used. The second icon is the light switch. This is used when your character sleeps. Once it is sleeping, you then must turn the light of for it. The third icon is used when you play a game with your tamagotchi. The games featured on the Original Tamagotchi is a guessing game where you have to decided if a number is going to be higher or lower. For example: Say if a number 5 was on the screen, you have to press A to guess higher and B to guess lower, if it was 8 and you pressed A then you have won. Each game gains 1 happy heart and removes 1lb if you win. The next icon is the medical icon. When your character is I'll, a black skull appears on the screen. To make your tamagotchi healthy again, you must use this icon to bring it back to health. The fifth icon is the toilet. You use this when your tamagotchi makes a mess on the screen, you select this icon and the screen refreshes and cleans up the mess. The sixth icon is the status meter. Inside the icon it displays your age, weight and discipline bar. The seventh and final delectable icon is the discipline. If your tama beats for no reason then this must be selected. This tells your tamagotchi off and fills up 25%of the discipline bar found in the status menu. Those are the main icons however, there is also a eighth icon. This icon lights up when your tamagotchi needs something.